The last page of Little Miss Austen: Pride & Prejudice, A Counting Primer, was hilarious, with its reference to Mr. Darcy’s “10,000 pounds a year,” so I was eager to see what Jennifer Adams and Alison Oliver would do with the story of Jane Austen’s Sense and Sensibility in a reinterpretation for babies and toddlers. Instead of approaching the novel through the numbers one to ten (or ten thousand), Adams this time has written a book of opposites. I can see why Sense and Sensibility seems to lend itself to a discussion of opposites. Many readers over the past two centuries have been tempted to read Elinor’s “sense” as the opposite of, and indeed the corrective for, Marianne’s “sensibility,” but the relationship between the two sisters is much more complex than that (I talk more about this idea in Chapter Three of my book Jane Austen’s Philosophy of the Virtues, especially on pages 58 and 81). So I was skeptical about the idea of stressing opposites in a retelling of the story of Elinor and Marianne. The format of the counting primer works well in Little Miss Austen: Pride & Prejudice, as several of the numbers fit neatly with Austen’s plot and characters: “1 english village” (though I do wish Adams had capitalized “English”), “2 rich gentlemen,” “3 houses,” “4 marriage proposals,” “5 sisters,” and of course “10,000 pounds a year.” Only a few “filler” examples are needed (such as “8 musicians”), and they do add to the setting even though they’re not tied to specific characters or scenes from the novel. In Little Miss Austen: Sense & Sensibility, however, there are fewer pairs of opposites that are directly relevant to Austen’s plot. The first pair is an excellent beginning: Norland Park is “BIG,” while Barton Cottage is “LITTLE.” The next pair works, too, as it makes sense that Elinor would choose a “HARD” chair, while Marianne would recline on a “SOFT” sofa (with a letter from Willoughby on it). The later pairing of “HAPPY” Willoughby and “SAD” Colonel Brandon works, even though it oversimplifies—which is of course understandable in any board book adaptation of Austen’s work. Some of the other pairings would have benefitted from a little more explanation in the illustrations, the way Oliver’s cute and clever portraits of the “5 sisters” showed us Mary Bennet reading a grammar book, for example. In illustrating “OLD” and “NEW,” Oliver gives us an old dress, bonnet, boots, and hankie, contrasted with a new dress, hat, shawl, and “fancy boots,” but the link with either the Dashwood sisters’ fall in fortune at the beginning of the novel, or rise in fortunes at the end, is not clear. The “EMPTY” and “FULL” chicken coops would work better in a Little Miss Austen version of Emma, in which “Mrs. Weston’s poultry-house was robbed one night of all her turkies.” The last pages, “DAY” and “NIGHT,” don’t appear to be linked to a particular day or night in Sense and Sensibility—I wish the illustration for the former showed Marianne out walking, and the latter showed her seeing Willoughby at the party in London. For that matter, why not a contrast between “SUN” (or at least “partial sunshine,” as Austen says) and then “RAIN” in the scene in which Willoughby first rescues Marianne after her fall on the downs? One pair of opposites is particularly odd. The illustrations for “OVER” and “UNDER” show “Edward” on a horse, riding over a bridge—but then the horse is in the water, under the bridge, and Edward is nowhere to be seen. The only other thing visible under that bridge is the tail of a sea monster, which appears to have eaten poor Edward. 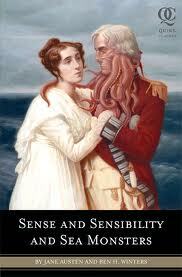 I guess this page belongs in Little Miss Austen: Sense & Sensibility & Sea Monsters. I do like the idea of introducing very young children to Jane Austen’s novels, but I was disappointed in the Little Miss Austen: Sense & Sensibility. While I don’t, of course, expect board book adaptations of Austen’s novels to convey anything close to the entire plot, let alone the full complexities of character and motivation, I think Little Miss Austen: Pride & Prejudice is much more successful than its successor in representing highlights that give the very young an idea of what to expect when they encounter Austen’s famous stories again. 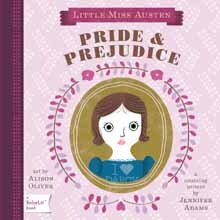 I’ll probably continue to choose Little Miss Austen: Pride & Prejudice, and the Cozy Classics board book adaptation of Pride and Prejudice, by Jack and Holman Wang, when I buy presents for babies and toddlers. And I’m looking forward to reading, and reviewing, the Cozy Classics version of Austen’s Emma when it’s released in November. What do you think about these board book versions of Austen’s novels? Are you a fan, and if so, which ones would you recommend to the young children in your life? I agree with your opinion of the S & S book. I enjoyed their version of P & P and was looking forward to S & S but I was very disappointed for all the reasons you mentioned in your review. Thanks, Lisa. It starts off so well – I was really hoping it would be as effective as their version of P&P. I wonder if they’re planning adaptations of Austen’s other novels. I would guess probably not Lady Susan – but you never know. Have you read the Cozy Classics P&P?